Paella is probably the dish people most seek out when they come to Spain. As you imagine your first trip to Spain, you probably see yourself sitting out on a terraza, drinking sangria and serving yourself seafood paella as you watch the sun go down on the beach. But here are a couple of bombshells for you: You shouldn't drink sangria in Spain, and paella is not (usually) a seafood dish. Paella originated in Valencia, on the east coast of Spain, but there are varieties available all over the country using all sorts of local ingredients. There are also other, similar rice dishes, as well as similar dishes that don't use rice at all. Before you make that trip to Spain, get familiar with different types of paella and other rice dishes available and how to spot a bad paella, as well as some of the best rice restaurants in Spain. Think Spanish cuisine and you'll think seafood and paella. You'll probably also think seafood paella. 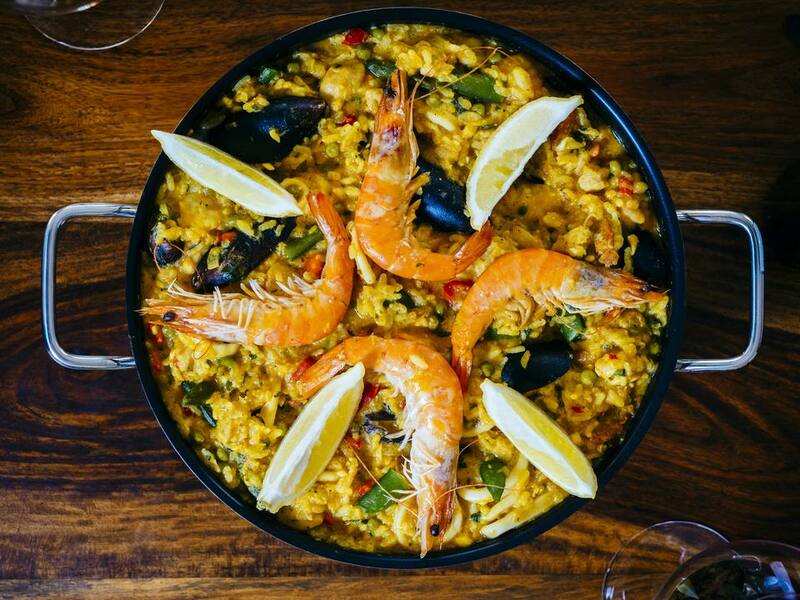 This photo of a dish of yellow rice with prawns and mussels in most people's idea of what paella is about. Most shun the cheaper meat paella in favor of the seafood version even if they aren't overly keen on shellfish because they see it as "more traditional." But they'd be wrong. The original paella, paella Valenciana, is a rice and meat dish, made in the fields around Valencia, and it usually contained chicken and rabbit and sometimes snails (now it's likely to only have chicken in most places). The vegetables will most traditionally be green beans and butter beans. That's right, no seafood. Other common paella varieties include paella de marisco, which is seafood paella (usually mussels and prawns and often garnished with red peppers), paella de verduras (vegetarian paella), and paella mixta (a combination of any or all of the above). Usually, the bones and shells of the meat and seafood are included in the dish, which means lots of digging into your rice with your fingers to separate edible from inedible. The exceptions are with arroz a banda, arroz senyoret, and arroz con magro, which have their seafood or meat shell-free and boneless. If you want to go beyond standard paella, these are the descriptions you'll need to learn to understand the other types of rice dishes in Spain. Classic paellas are described as seco, or "dry." At the other end of the scale, you have caldoso, which means "brothy" or "soupy." In between, you have meloso (sticky) and cremoso (creamy), both about the consistency of risotto. The dish in the photo, arroz con bogavante (rice with lobster), is a caldoso dish. These are the headings you'll see on a paella menu; the exact dishes under them vary depending on the inventiveness of the chef. For example, you'll find spicy octopus sticky rice at El Llagut in Tarragona and an Asturian cheese and mushrooms dish at La Genuina in Oviedo. Be adventurous. Go for the classic Valencian dish for a taste of tradition but explore the whole gamut of Spanish paella dishes for the full experience. Serve someone a plate of yellow rice, perhaps with a mussel or two, and many will think that they've just been served a paella. But they haven't. Check out these two photos: They were taken a half an hour apart in two different restaurants. They were served in the same type of pan, both with yellow rice and a similar number of vegetables. But look at the difference. The key ingredient to good paella is the rice and how the rice is cooked. Standard long-grain rice with a little food coloring was used in the dish on the left. The dish on the right has genuine paella rice. You can tell by the way the rice on the right sticks to the bottom of the dish that it was cooked in this pan. The paella on the left was simply scooped into the dish just before serving. You might not be so brave as to walk out of a restaurant that serves paella like that on the left. So how can you spot a good paella before it reaches your table? Look for a restaurant that specializes in rice. Most big cities have some good places to have paella. 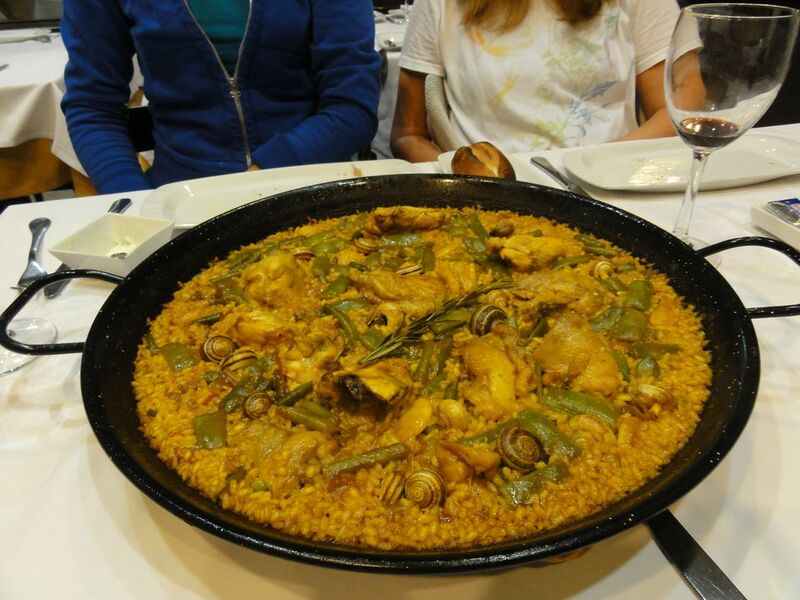 An arroceria is a type of restaurant specializing in rice dishes, so paella will always feature highly there. Avoid Paellador. There are restaurants all over Spain that have signs outside offering paella from one of the big paella makers, and Paellador is one such maker. These paellas are bought frozen and are what you could buy from the frozen department of your grocery store. The restaurant itself might not be a chain, but the paellas are mass produced and not the authentic dish. Go for places that insist on a minimum of two people. Paella dishes are usually quite big; individual paella dishes exist, but they are not the ideal size to make a paella. The smallest practical dish is for two people. So restaurants that specify a minimum number of people almost certainly make their paella fresh. Servers bring the entire dish to your table for you to help yourself. There are restaurants that will serve individuals, but at least when they specify a minimum, you know that the paella will be fresh. Making paella is a skill, but it's a skill that's easily learned. There are places all over Spain where you can either take part in a paella class or watch someone else make paella. You can get hands-on experience of preparing a paella in Madrid, Barcelona, or Valencia. In each case, you will be taught how to make the base sauce, how to use a paella dish, and when to know a paella is ready (probably the hardest part to learn from a recipe). One of the best paella restaurants in Spain is in Malaga. Bodega El Patio has an extensive a la carte paella menu, along with other rice dishes, but the big attraction is the restaurant's daily paella demonstrations. Every weekday you can watch the chef make a large paella in the eating area. You can then order a portion of the paella at an unbeatable price. Check out these restaurants if you are on the hunt for some of the very best paella in Spain. Around the central market in Valencia, there are lots of restaurants that sell paella. This is what they do, all day, every day, using ingredients bought straight from the market. You can't go wrong with any of these. Hotel Hospes Palau de la Mar came in second in the Concurso Internacional de Paella competition, so its dish is worth checking out, too. But really, pretty much anywhere in Valencia will make a good paella. There are a couple of rice restaurants in Tarragona, just outside Barcelona, but at the top of the list is El Llagut. It doesn't actually make paella; its offerings tend to be the caldoso or meloso styles. In Madrid, check out El Arrozal in La Latina. If you're in Malaga, the place to go is Bodega El Patio, where you can watch a paella being made right in the restaurant. Most people visiting Asturias wouldn't think to go for paella, but La Genuina in Oviedo does some interesting things with local ingredients, plus the chefs are happy to make individual paellas. Barcelona's main thoroughfare, Joan de Borbo, is lined with busy restaurants offering paella at middling prices. Many have paella included in their set menu. Two stalwarts along this avenue are the boisterous, eye-catching El Rey de la Gamba and Arros, which has a brilliant value-for-money range of traditional rice dishes. Can Majo on the Barcelona beachfront is a legendary paella restaurant. But be ready for the prices; it's a bit on the expensive side. Two of the finest restaurants at Barcelona's Port Olimpic are La Fonda and El Tunel de Port, both situated on Moll de Gregal. Both have a breezy setting and great alfresco dining, along with beautiful harbor or beach views.